How to set up TimePilot's iButton Solo Lock, presented by former Technical Support Specialist Brian Estok. 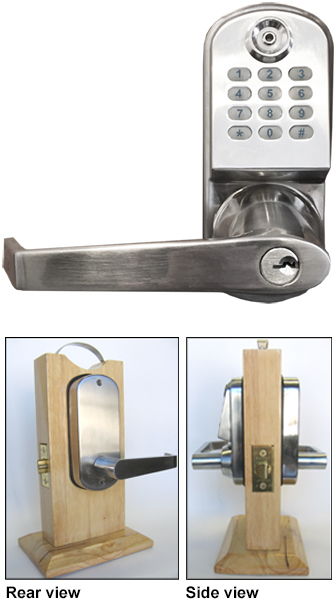 The Solo Lock looks just like our CrossOver X25 lock, but the Solo is simpler to use, does not use PC-based software (and therefore doesn't have some of the features available to users of the X25) and is less expensive. The Solo is set up right at the lock by pressing key combinations, while the X25 uses AccessPilot Windows-based software for setup and determining who used the lock and when. Keypad functions: Permanent codes, temporary codes, one-time codes, timed operation. Setup method: Set up users from keypad. Does not need software. Auto Lock Function: Set the lock to automatically lock at a preset time. Lock back time: 1-25 seconds. Set in software; default is 5 seconds. Key bypass: Standard Schlage C6 (can be re-keyed by a locksmith). To download a brochure on the iButton Solo, as well as the Solo software manual and installation instructions, please visit our Support Center.